feeding the hungry | Enough for now . . . Enough for now . . . 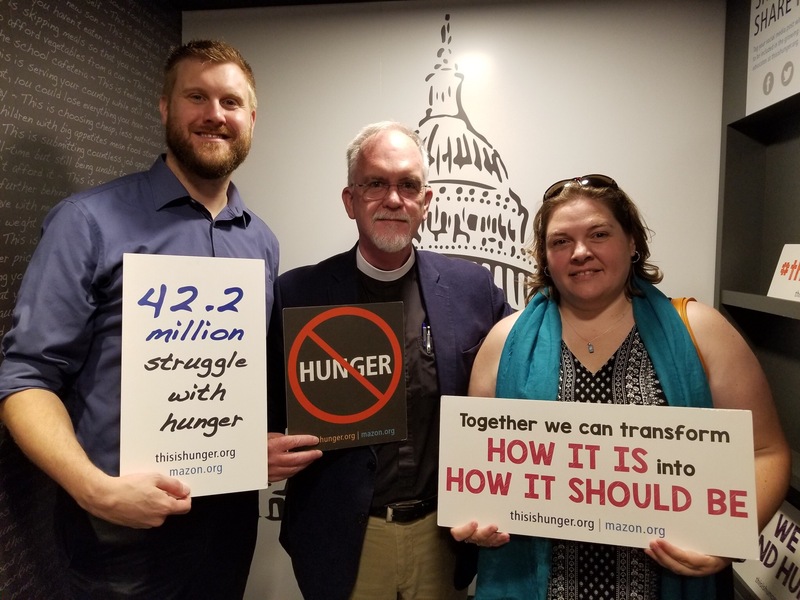 This morning I visited, “This is Hunger,” a traveling exhibit created by Mazon, a national Jewish organization addressing issues of food insecurity and justice in the USA. Locally, this exhibit is sponsored by Episcopal Community Services and Jewish Family Services. Temple Beth Shalom in Overland Park is the location of this traveling exhibit. It will be there until July 13. There is more information on our St. Paul’s Facebook page ( https://www.facebook.com/StPaulsKCMO/ ) about this exhibit and how to get tickets (free), which are required. Please don’t miss this amazing and well designed experience. “Food charity.” Our churches have long and arguably successful records in the area of food charity. Food pantries, soup kitchens, neighborhood gardens, and other similar programs represent models familiar to church activism across the country. These food ministries are essential given the increasing costs of food and reduction of public programs of food support available to hungry people. Yet the observation by Mazon of public policy changes needed to respond to the huge dimensions of food insecurity and hunger compels the faith community to re-imagine its limited reactive role and challenges it to a more pro-active role addressing matters of public policy. It is suggested St. Augustine of Hippo, the great 4th-5th century theologian of the nascent Christian movement, once wrote, “Charity is no substitute for justice.” Surely, in matters of food insecurity and hunger, this observation challenges us to ponder our moral obligation to not only feed hungry people (charity) but our equally important moral and faith obligation to active, public advocacy for more equitable public policy for the food insecure and hungry (justice). Such advocacy would seek food/economic independence for many of those currently struggling with food insecurity and hunger. Interestingly, the Hebrew word for charity is tzedakah. The word tzedakah shares an etymological root with tzedek which means justice. Linguistically, this connection suggests charity must be built on a foundation of justice. In the absence of such a foundation, I believe the religious community must be faithful in working to build such a foundation, seeking diligently to create a more just society. Indeed, we should be “doing justice” (Micah 6.8) with the same zeal and energy we expend in our efforts to provide for the acute and immediate challenges of feeding hunger people in our soup kitchens and food pantries. Stand UP KC, faithfulness matters! On April 14, 2016, a national day of labor action for low-wage workers, I was asked by the worker’s organizing group to offer a faith-based reflection at an event focused on the hardships and difficulties of low-wage childcare workers. Sadly, childcare workers all over this country are entrusted with our most precious gifts from God and are paid minimum wages or near minimum wages for their time. Ironically, most childcare workers cannot afford childcare. I offered them a reflection written after I read the journal of a symposium hosted by William Temple (later Archbishop of Canterbury) when he was a young priest. The symposium and the subsequent journal were titled, “The Industrial unrest and the living wage (a series of lectures) given at the interdenominational summer school, held at Swanwick, Derbyshire, June 28th-July 5th, 1913.” In 1913, this symposium was arguing for a basic minimum wage in Britain of about 26 shillings/week or about $13/hour in US 2014 dollars (converting for inflation, pounds to dollars conversion, labor values, and the longer work week at that time). Let this sink in . . . in 1913, this group (albeit in Great Britain) was arguing for a minimum wage about 60% greater than the minimum wage in the USA today. Moreover, it was arguing for a higher livable wage! One hundred and three years later, we are still trying to solve the challenge of a just and livable wage. May God be patient and merciful with us! Thank you all for being here today. Today, all over the city, all over the country, low-wage workers are standing up for themselves. You are standing up for fair and living wages. You are standing up for dignity and respect. You are standing up for the American ideals of Life, Liberty, and the Pursuit of Happiness. Ideals that are the bedrock of our nation. You are not asking for charity! You are not asking for favors! You are asking for respect, dignity, and a living wage! You are asking for your fair share of the American Dream! Today, I am privileged to be here with low-wage workers who are standing for our country’s time-honored, though sometimes obscure, belief in justice. Some ask me, “What has this to do with religion?” As a Christian minister I am compelled to recognize God’s calling to do justice and love mercy! God expects this of me and every person who embraces the God of all creation. As a faithful person, I recognize all people as souls created by God. All of you here today, especially you working men and women that struggle with low-wages, you are souls of God’s making. You are made in the image of God and aspire within yourselves to seek God’s purpose in your lives. Yet we know low wages burden you with the constant fear of not being able to meet basic needs like food, housing, utilities, healthcare, childcare, and uncertainty about the future for yourselves and your children. You are “souls,” brothers and sisters in Christ, who I am commanded by God to love and for whom I am commanded to do justice and to seek mercy. A society as rich as ours in which a large portion of honest and industrious workers are unable to secure continuous, full-time employment at a living wage which will maintain a family in a condition compatible with the requirements of stable and decent living is, in my opinion, an unjust and poorly managed society and an unfaithful and unrighteous society. Christian people who stand passively unresponsive to such sinful injustice, unfaithfulness, and unrighteousness are people who have lost the vision of their calling by God to do justice for the least among us. A Christian who does not act for justice and dignity for all people, especially the vulnerable and poor, is a faith-challenged Christian indeed. –is on those who do not shed penitential tears for our brothers and sisters in Christ who struggle to survive on wages too low to survive. –is on those who do not burn in their hearts and souls for changes in these unjust economic and employment systems. –is on those who do not understand that poor, excessively low wages are destroying people by assaulting their character, poisoning their minds, demoralizing their humanity, and breaking their immortal spirit. –is on those who do not agitate and work and sacrifice and pray for the ending of low wage misery for our brothers and sisters in Christ. Faithful people, God’s people, religious people everywhere should be demanding the dawning of a new time of fair, livable wages and that dignity, respect, and economic security should be counted as an inalienable right for all working people and their families. Today, I am privileged to introduce to you three persons who are personally involved in the plight of our childcare workers. Childcare workers are trusted with God’s most precious gift to us: Children. Yet for them and many of their fellow low-wage workers, the resources of professional, licensed childcare is unaffordable. Our speakers will help us better understand the reality of this human tragedy . . .
Isaiah 1.17—Learn to do good; devote yourselves to justice, correct oppression; aid the wronged . .
Proverbs 31.8-9—Speak up for the mute, for the rights of all the unfortunate. Speak up, judge righteously, champion the poor and the needy. Proverbs 14.31—He who withholds what is due to the poor affronts his Maker; He who shows pity for the needy honors Him. Proverbs 29.7—A righteous man is concerned with the cause of the poor; a wicked man cannot understand such concern. Proverbs 22.16—To profit by withholding what is due to the poor is like making gifts to the rich—pure loss. Micah 6.8—What the Lord requires of you: Only do justice, and love mercy, and walk humbly with your God. Jeremiah 22.16—He upheld the rights of the poor and needy—then all was well. That is truly heeding me, declares the Lord. Acts 18.9– the Lord said to Paul in a vision, ‘Do not be afraid, but speak and do not be silent. Matthew 25 Parable of the sheep and Goats . . . This is the final incidence of wilderness murmuring against God and Moses for lack of water and lousy food. While the water matter is certainly a reasonable concern, what is it about us people and “institutional” food. Apparently since the time of Moses (can anyone find an earlier example?) we are hard-wired to complain about food served institutionally! I would think, in the desert, hot, sweaty, blistered, and walking for a long, long time, the Hebrew people would just be glad they had food at all. But no, they want NOLA/Emeril prepared cuisine. It’s a tough life being a wandering Aramean (see DT 26). Speaking of serving good food, I am honored to serve on the board of Kansas City Community Kitchen (KCCK). Recently, under the leadership of our new CEO Beau Heyen, we have changed our whole serving strategy. Gone are serving lines and cafeteria style feeding of the masses. We have replaced it with something more elegant and respectful of our customers. One would even hope those desert wanders in the lesson from Numbers might enjoy stopping in our place. I can never quite anticipate what the ushers at St. Paul’s may do next. I remember one time, when we announced in the parish newsletter that toilet paper was the most needed item for people to bring for the food pantry, I almost lost my composure on Sunday morning standing at the altar and watching the children bring the “food basket” (each Sunday we bring representative items donated to the food pantry as a part of the offering) up with the offering. It was loaded to the brim with TP. The snickers came down the nave like a wave making its way to shore as the children passed each row holding proudly aloft large containers of “Angel Soft” TP. By the time we realized what was approaching us, the choir and I were barely containing our laughter! It was all I could do to stay focused on the liturgy. It was a great moment and one the ushers still recall very proudly. A favorite thing about the ushers is their willingness to invite visitors to help bring the bread and wine to the altar for the Holy Eucharist. While on many Sundays they invite parishioners to help with this, they have a sense for finding the visitor who will be amazed and thrilled to be included in this way. Many of our newer members share with me that on their first visit to St. Paul’s the ushers asked them to help with the bread and wine. “But I don’t know what I am doing . . . I am not even Episcopalian,” is a common reaction. “Don’t worry,” the ushers reply, “just walk it to the altar; someone will meet you there.” It is always interesting to watch as visitors cautiously walk down the aisle with puzzled looks on their faces as they bring the bread and wine to us. In a few moments, when I offer them the Body and Blood of Christ, there seems to be an aura of “I was part of this” on their faces. It is a moment of joy for me. Occasionally, the ushers exercise a wonderful sense of grace in their actions. Recently, one of our food pantry clients started attending church. He is a nice young fellow who happens to be homeless. He seems to enjoy very much being in church with us. A few weeks ago he even convinced his girlfriend to attend with him. On occasion, when I talk with him at coffee hour or engage him in conversation outside the church, he discusses with me matters of interest in my sermons (so I, of course, like him). He corrected me recently about forgetting, in a sermon remark, a character in Tolkien’s Hobbit trilogy. He was right. This past Sunday, when I looked up to let the ushers know we were ready for the alms and food pantry offerings to come down the aisle, who should I see carrying the food pantry basket but this same young homeless fellow who only a few days before I greeted in line at the pantry. Just as laughter burst forth as the “Angel Soft” processed down the aisle another time, tears rolled down my cheeks as this young man, with a smile and bounce in his step, brought this food offering through the congregation to the altar. There was the light of Christ radiantly bursting forth in our midst. I am blessed to serve a parish that understands very deeply the words of Jesus in the parable of the sheep and goats, “when you do it to the least, you do it to me.” Our doors are open, all are welcome, all are included, and all are embraced by the love of God. No exceptions! It is a cold and blustery day, the temps hovering around “freeze your buns off.” The visitors to Kansas City Community Kitchen (a ministry of Episcopal Community Services) for the daily hot lunch are a bit slow coming in, allowing more time for interaction and brief bits of conversation with the people as they come through the food line. There is a broad assortment of people, some clearly in need of a hot meal and others passing through checking their options. Fashion statements are made, some in spite of poverty and others because of poverty. One young man wears many layers of clothes year round; though he looks very large as he passes through the line, I wonder if he might actually be skinny once peeled out of clothes I suspect never leave his body. Some are noisy and boisterous, others pass quietly, deep in their own thoughts, hardly noticing our presence as we try to welcome them, offering our clever quips for the day. Some reciprocate while others look at us like the foreigners we are, inarticulate in the language and understanding of the street. Here, I am an alien. Still, I come back each fourth Monday, offering in some small and inadequate way my allegiance to this gift of mercy—a good, hot meal in a safe place. Luckily for me, the clients are tolerant. As they pass through the line I almost miss the tiny little girl ( maybe 3 or 4) accompanying the very young man (early 20’s) in an over-sized sport logo jacket. She peeps over the serving line, her grimy little hands gripping the metal rail and her big brown eyes sparkling as she sees the food. Some attempt to brush her blondish brown hair failed ; it is dirty, matted, and knotted but it is out of her face. Her eyes carefully follow the tray to the end of the serving line. I am not sure she really believes the food is for her. The young man, I assume her father, takes the tray and walks her to the table directly opposite the serving line. They sit down and she eats her food, every morsel. No whining and complaining that the food is too hot or too cold, or the food tastes funny, or not what she wanted. This little girl eats everything and scraps the tray clean. The young man, sitting close beside her, wraps his arm around her. Occasionally, she turns and whispers something into his ear. He softly answers and she goes back to eating. Americana right out of Norman Rockwell except, of course, for the hues of poverty that distort everything. At one point, a very tall and menacing looking old man comes and stands at the far end of their table. His face weathered, his long, blond hair dirty, his overly long arms dangling by his side, his parka and clothes filthy and beyond worn out. He stands quietly, staring at the little girl as she and her dad stare down at their food, watching attentively lest a crumb attempt to escape. He stands there without moving for a long, long time. I am beginning to get a little uncomfortable, wondering if this fellow harbors some malevolent intent, just waiting for the right moment to grab the little girl and run. After what seems way too long, the little girl glances up and their eyes meet. He extends a hand and awkwardly flips something toward her. It rolls to her tray. It is a Tootsie Roll Pop. She picks it up, looks back at the man, and smiles. No words. He turns and walks away. Surprised by the rough tenderness of his action, I imagine him yearning for something long lost but remembered in this small gesture of generosity to a tiny little girl. The last stragglers are being hustled out of the dining area. The floors swept, the chairs put up in anticipation of the mop brigade coming out to clean the place for the next day. We fed the hungry. It is time to leave. I wonder where this young father and his little girl go when they leave here? Where will she go, what chances will she have? Sadly, I am sure “Oh the Places You’ll Go” is not on her nighttime reading list. Pat Rudy on One more summer . . .
Jessica on One more summer . . .
Sunday Eucharist 8:00 & 10:30 a.m.
South Sudanese Service (Dinka) 1:00 p.m. Enough for now . . . · this sliver of faith, like a new moon must be . . .
this sliver of faith, like a new moon must be . . .